First of all, many congratulations to Brad Miller for being the AL player of the week! Nelson Cruz was sort of expected back in April, but so far this year the only other team that has had two has been the Yankees. Brad Miller has done very well for himself this week, and it’s great to see. 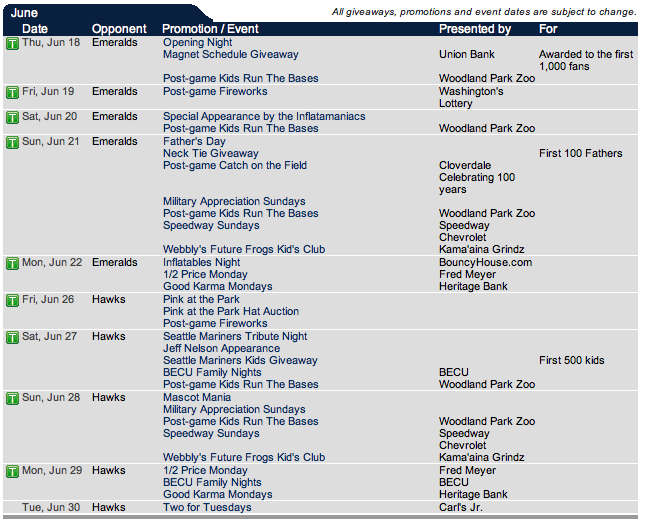 The Everett Aquasox released their promotional schedule about a week ago, but I never got around to posting it here. I could link to it, but posting media is more fun. 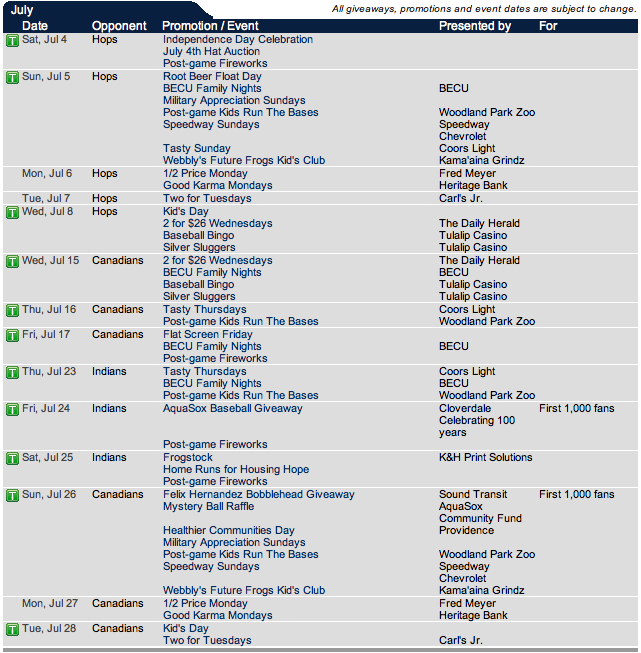 Opening night is on Thursday, June 18th against the Eugene Emeralds. Right around the corner! Everett, Wash. – Let the countdown begin! The Everett AquaSox are excited to announce “30 Days of Opening Day,” a preseason promotion featuring contests, giveaways, discounts and more every day to celebrate the upcoming home opener on June 18th. Beginning Tuesday May 19th, fans are encouraged to check Facebook, Twitter, and aquasox.com for a chance to win tickets and autographed memorabilia, participate in trivia games and fan photo contests, be the first to see big reveals for the season and more. Merchandise Mondays (5/25, 6/1, 6/8, 6/15) – Every Monday we will offer exclusive deals for our entire team store or exciting reveals of new merchandise for the 2015 season. Discounts will be valid online and in our team store so check our website, Facebook, or Twitter account on Mondays at 9am to get all the fun details. Trivia Tuesdays (5/19, 5/26, 6/2, 6/9, 6/16) – Test your AquaSox knowledge on #TriviaTuesday! Visit our Facebook and Twitter account on Tuesdays at noon to answer a fun trivia question. The first fan to answer correctly on each will win a free gift card to Carl’s Jr. or Fred’s Rivertown Alehouse. Weenie Wednesdays (5/20, 5/27, 6/3, 6/10, 6/17) – Get a free voucher for a ballpark hot dog, chips, and a drink when you spend $25 on tickets or merchandise every Wednesday at our team store (visit our front office at 3802 Broadway in Everett). Theme Thursdays (5/21, 5/28, 6/4, 6/11) – Theme Thursdays will feature a theme night or promotion for the 2015 season and fans that comment and share the post on Facebook will be entered to win 4 Upper Box Seat tickets to that game! Former Frog Fridays (5/22, 5/29, 6/5, 6/12) – Every Friday leading up to Opening Day, the AquaSox will feature a Seattle Mariners prospect that once played in Everett. Check in with your favorite former frogs on our website, aquasox.com. Savory Saturdays (5/23, 5/30, 6/6, 6/13) – Prepare your palate for the 2015 season! Every Saturday we will reveal delicious new food served at the ballpark this season and two lucky fans that comment and share the post on Facebook will win a free voucher for the food item. Share it Sundays (5/24, 5/31, 6/7, 6/14) – Share a photo showing your AquaSox pride and win an autographed ball! On Sundays fans are encouraged to post pictures from AquaSox games, wearing AquaSox gear or creatively showing their team pride on Facebook or Twitter. Tag the AquaSox in your post and we will choose one winner each week. So head up to Everett and enjoy some minor league ball, and see some possibly future Mariners. If you’ve never been, it’s a fun way to spend an evening. The atmosphere is relaxed, families seem to have a lot of fun there, and the quality of the ball is not too shabby, generally speaking. Knowing these guys might some day be huge stars is a draw as well. I have photos from the two weekend games I attended, but I think I’m going to wait until tomorrow to post them. The Mariners are headed to Baltimore to play my Birds, so you know I’m going to be attached to the couch for the early game tomorrow after work. The Orioles are struggling a bit this year, and are only a bit behind us, standings-wise. We are tossing out Taijuan Walker, Roenis Elias and JA Happ against Miguel Gonzalez, and two other as-of-yet-unnamed hurlers. The O’s seem to be dealing with a small plague of injuries this month, and given that and offseason moves, their roster is a little shaken up. Of course, these series are very non-stressful for me, as either team winning would make me happy, and I am looking forward to seeing OPACY on TV (I’d love to go back sometime soon). 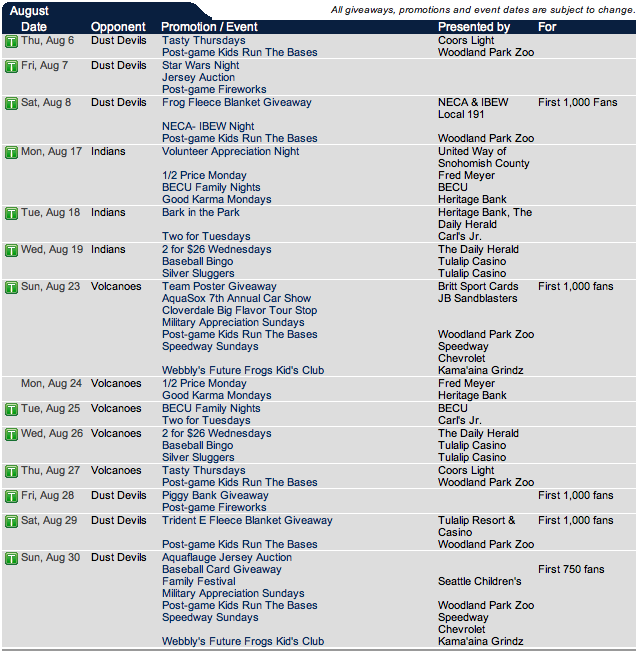 It will be a good baseball week!